She was wearing a Mayan dress, the traditional attire of indigenous people in central America, and the hotel’s response was also traditional: throw her out.Staff at Cancun’s five-star Hotel Coral Beach appear to have assumed this was another street vendor or beggar, so without asking questions they ordered her to leave. Except the woman was Rigoberta Menchú, the Nobel peace prizewinner, Unesco goodwill ambassador, Guatemalan presidential candidate and figurehead for indigenous rights. The attempted eviction, an example of discrimination against indigenous people common in central and south America, backfired when other guests recognised Ms Menchú and interceded on her behalf.The human rights activist was in the Mexican coastal resort at the request of President Felipe Calderón to participate in a conference on drinking water and sanitation and was due to give interviews at the hotel. David Romero, a journalist and newsreader who was due to interview her for state radio Quintana Roo, told local media that hotel security tried to eject Ms Menchú from the lobby. They relented when told who she was. It was said not to be the first time a hotel has tried to throw her out. 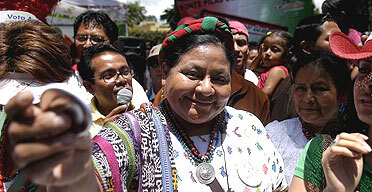 Ms Menchú, 48, was awarded the 1992 Nobel peace prize for protesting against human rights abuses during Guatemala’s brutal civil war. Commentators noted the irony of upmarket resorts discriminating against real Maya while trying to attract tourists with fake Mayan architecture and spectacles.